When you hear the words “air pollution,” you may think of a smog-filled metropolis. What most of us do not realize: The concentration of air pollutants inside people’s homes and other indoor spaces may be up to 100 times higher than outside pollutant levels — even in large cities. Many indoor pollutants cause a musty, noxious or otherwise unusual smell. But some offenders may cause no odor. The only sign of trouble may be the development of symptoms. Older adults are at especially high risk since their bodies process and eliminate toxins less efficiently. Among the most common indoor air pollutants are dust, pollen, animal dander, dust mite droppings, tobacco smoke, molds, and fumes from your stove, furnace or car. Pollutants that are less well-recognized include those from household products containing volatile organic compounds (VOCs) — for example, pressed-wood products, paints and paint strippers, varnishes, carpeting, degreasers, air fresheners and pesticides. Depending on the product and other factors, household products can emit VOCs for days, weeks or even years. Frightening report: The EPA has found that concentrations ofabout a dozen VOCs — such as terpenes and formaldehyde — are typically two to five times higher inside people’s homes than outdoors. Many of these chemicals are known to irritate the lungs, skin and eyes. Some, including formaldehyde, benzene and perchloroethylene (a chemical used in drycleaning and spot removers), are identified by the EPA as known or suspected carcinogens. Radon, a radioactive gas that comes from the natural breakdown of uranium in soil, rock and water, is also a common indoor air pollutant and is believed to cause or contribute to approximately 20,000 lung cancer deaths annually in the US. Eliminating or reducing air pollutants at their sources is your first step. For example, to protect your family against carbon monoxide, having your flues, chimneys and furnace or boiler inspected and cleaned at the start of each winter is one of the best actions you can take. Also recommended: Install a carbon monoxide detector in the hallway outside bedrooms. If your house has an attached garage, place a carbon monoxide detector nearby inside your home. For VOCs: Use latex instead of oil-based paints for interior walls… properly discard old paints and varnishes (which can release gaseous compounds even from closed containers)… avoid potentially harmful household cleaners, such as ammonia and chlorine bleach… and consider using all-natural cleaning products (such as those from Shaklee and Seventh Generation). Caution: Pressed-wood products, including particleboard, hardwood plywood paneling and medium-density fiberboard, may emit formaldehyde. For “greener” remodeling or construction materials, look for items approved by either the Greenguard Environmental Institute (www.greenguard.org) or Green Seal (www.greenseal.org). These two nonprofit organizations test and certify low-VOC-emitting furnishings, flooring, paints, lumber and other household products. Helpful: If you want carpeting or rugs in your home, look for the Carpet and Rug Institute’s Green Label or Green Label Plus certification. This ensures that the brand meets certain standards for VOC emissions (for more information, consult www.carpet-rug.orgm). For pollens and pesticides: Keep windows closed during high-pollen season (roughly March through October) or when pesticides are being sprayed nearby… put doormats outside each entrance and leave your shoes at the door to avoid tracking in pollen and pesticide residues… and limit indoor pesticide use (instead, use baits and preventive steps, such as caulking cracks). According to the EPA, Americans get about 80% of their pesticide exposure inside their homes or other buildings. For mold: Use a dehumidifier or air conditioner to keep indoor humidity levels below 50% (as measured by a hygrometer, a mechanical or electronic device available at hardware stores, starting at $15)… properly clean water catch trays in dehumidifiers every few days… promptly repair water-damaged walls, ceilings or floors… keep gutters clear and make sure they channel water away from your foundation… and take necessary steps (such as installing a sump pump) to ensure a dry basement. For radon: Home owners should test their indoor air for radon. Do-it-yourself tests are available at most hardware stores for about $20. If you detect an unacceptable level of radon gas, contact a radon remediation specialist. When addressing indoor air pollutants, adequate ventilation is also important. Open your windows and doors (unless you have allergies and it’s high-pollen season). Install kitchen and bath exhaust fans that vent to the outside. To keep air circulating throughout your home, use attic or whole-house fans, if possible. If you follow the steps described earlier but continue to suffer symptoms, air cleaners may help. Air cleaners use either a mechanical filter that traps particulates as air passes through it… or an electronic setup that draws in air, gives particulates an electrical charge and then collects them on a plate or filter — or a combination of both methods. Important: Air cleaners do not eliminate gases or particulates that have settled on surfaces. 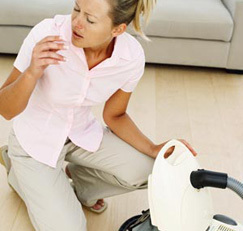 Portable air cleaners can be effective for individual rooms. Ensure that the cleaner is adequate for the room size and check the clean air delivery rate (CADR) — the volume of filtered air delivered by the unit. The CADR should be at least two-thirds of the room’s area (for example, 80 for a 120-square-foot room). In-duct filters provide whole-house air cleaning. When selecting an in-duct filter, check the minimum efficiency reporting value (MERV) rating that tells you how efficiently a filter removes airborne particulates. If you have allergies, asthma or other respiratory problems, your best bet is a medium-efficiency pleated or extended surface filter with a MERV rating of 10 to 13. Coughing or congestion (not due to a cold). Source: Richard J. Shaughnessy, PhD, program manager for the University of Tulsa’s Indoor Air Program, a center dedicated to improving indoor air quality in homes, schools and workplaces. He served as the principal adviser to the Environmental Protection Agency on development of its Indoor Air Quality Diagnostics course. Dr. Shaughnessy has also conducted air quality research in China, South Africa and Australia.